This is point where things got complicated. Here in Northern Ohio we have had one of the wettest spring / summers in a very long time. This is a good thing, turns out. The wet weather informed every decision we made from this point on. Our land is on a ridge, which is to say it was the shore of Lake Erie a very very long long time ago. A ridge in this area can often have sandy soil. Sandy soil is not ideal for building a house. Wet sandy soil is even worse. The excavation company came in to do a test dig. They dug down 6-8 feet and found pure sand about 5 feet down. We had to call in an engineer who had a company come out and take core samples. This is a process where a giant drill removes a plug of land for analysis. Turns out as expected, 4-5 feet down we have pure wet sand which continues for 6-8 feet before clay and rock reappear. 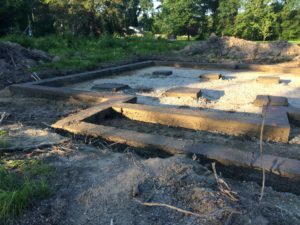 The engineer recommended that we do not dig down for a basement / foundation and that we build the house on top of the existing ground. 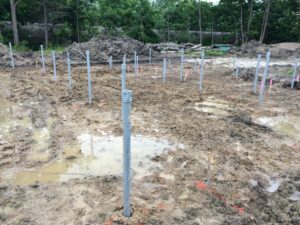 In addition to not digging down, it was recommend that we install helical piles to secure the foundation to the solid ground below the sand. Helical piles are long steel pipes that are drilled down and secured to the solid ground 14-18 feet down. 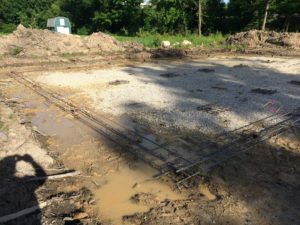 This video covers the installation of the piles, the layout of the footers and the installation of the footer foundation. Please comment on YouTube. Like and subscribe if you want to keep up with our projects.